Crews were just applying the finishing touches at the Security Trust Lofts when we visited last summer. (They’re now well into leasing.) We also checked out a vast, unfinished storefront with a mezzanine on the ground floor. It was unclaimed at the time, but it would only take seven months for that dark, beat-up space to become something entirely unrecognizable. Today, it’s Anytime Fitness that’s applying the finishing touches to their new Detroit location, the first 24-hour gym downtown. 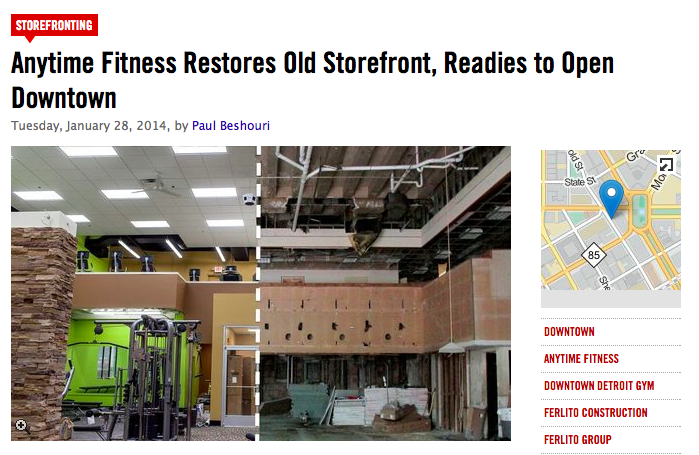 Even if Anytime Fitness was to move elsewhere (and we certainly hope it doesn’t), the space would still be much better off than it was previously. The developers, The Ferlito Group, daylighted the building’s huge original windows, which were covered up decades ago. Compared to our old photos, the present day shots look so much brighter because an entire wall of glass has since been unearthed. Another highlight: the staircase. Swooping down from the mezzanine, the brass staircase is a beautiful relic of unknown origin. The stairs’ unique measurements don’t conform to city building codes, but the developers successfully fought to preserve them. Anytime Fitness is billed as a smaller “neighborhood gym,” meaning private restrooms (with an available shower) instead of vast locker rooms. Members are able to access the gym 24 hours/day with a key fob. Management expects to officially open sometime during the first week of February. Until the end of that week, memberships are available for $32/month, with a $49 enrollment fee.